Indium Corporation's Dave Sbiroli, Applications Development Program Manager, was presented with the IPC Distinguished Committee Service Award at APEX 2009 in Las Vegas, Nevada. This award is given to IPC committee members who have made an exceptional contribution to a specific standard or other IPC program. 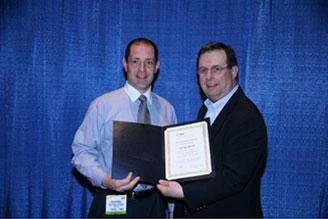 Dave's award was in recognition of his efforts to help develop the new J-standard (J-STD-004b). Dave joined Indium Corporation in 1995. He has a BS in Mechanical Engineering Technology from SUNY Institute of Technology. Dave achieved one of the highest scores on the SMTA Process Engineer certification exam and earned his 6-Sigma Green Belt from Dartmouth College. He actively participates in Industry Standards Development with the IPC and projects with INEMI. Dave is based at Indium's global headquarters in Clinton, NY, USA. The IPC is a global trade association dedicated to furthering the competitive excellence and financial success of its members who are participants in the electronics industry. They are the leading source for industry standards, training, market research, and public policy advocacy for the global electronics industry. For more information about IPC, visit http://www.ipc.org.